Stigmata's are spontaneous bleeding wounds which appear in various places on the body, such as the hands, the feet, the back, the forehead, and the side, and, in the Christian context, are considered to be manifestations of the suffering endured prior to, and during, Jesus' Crucifixion. Some stigmata have unusual shapes, such as a cross or a circle, and a few even glow in the dark. Many of them also produce a pleasant perfume-like odor. In a few rare cases they aren't even visible, but are known to be present from the pain that they cause. Healing is usually reported within a few hours after the wounds appear. Some people who suffer from stigmata report feelings of sadness, depression, weakness, and physical pain prior to the bleeding. The blood will pour forth from openings on the body for an unknown amount of time -then just as suddenly disappear and heal. There have been hundreds of reports from those who claim to have had experienced wounds similar to those inflicted on Jesus. Within those cases there have been those who have fraudulently created the wound for various reason. 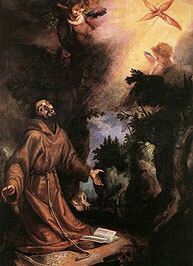 The first well-documented case and the first to be accepted by Church authorities as authentic, was that of Saint Francis of Assisi (1182-1226), who first experienced stigmata in La Verna, Italy, in 1224.